From head-turning good looks to incredibly refined performance, the Mazda3 does everything exceptionally well. In fact, according to Edmunds.com's 2017 Mazda3 review, the compact car is one of the best options in its class if you are looking for a tech-savvy interior, great fuel economy and excellent safety ratings. 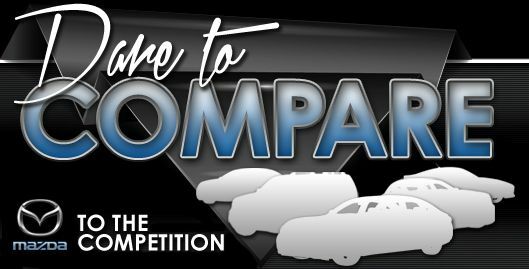 Learn more about the latest incarnation of this popular compact sedan and hatchback below! The 2017 Mazda3 in Houston is routinely acclaimed for its sleek and sporty style, and this model year's exterior refreshments--including restyled front and rear bumpers--make it hotter than ever. 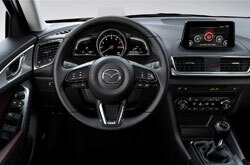 Inside, the car is outfitted with a redesigned dashboard and a new steering wheel. Regardless of which trim you opt for, you'll be impressed by the car's upscale interior and long list of comforts and conveniences. 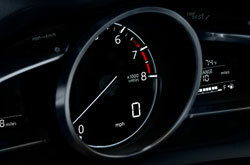 Keyless ignition, cruise control, two USB ports, voice controls, Bluetooth connectivity and a 7-inch touchscreen interface are just a few of the standard features on the entry-level Mazda3 Sport. 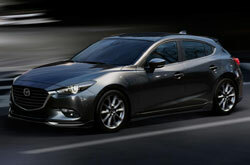 The Mazda3 is also available in Touring and Grand Touring trims. Each offers even more amenities from a heated steering wheel and dual-zone automatic climate control (Touring) to leather seating and a head-up display (Grand Touring). Riding into 2017 with new SKYACTIV®-VEHICLE DYNAMICS with G-Vectoring Control, as well as a retuned suspension, the compact car ups the ante on performance, according to 2017 Mazda3 reviews. Its incredible handling and silky smooth ride quality are matched by knockout performance from one of two available powertrains. The starting engine is a 155-hp, 2.0-liter four-cylinder, while Touring (2.5L) and Grand Touring models upgrade to a 184-hp, 2.5-liter four-cylinder. 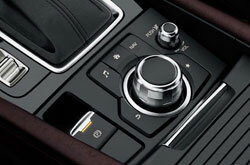 Both engines can be had with either a manual transmission or an automatic. The 2017 Mazda3 in Houston can be equipped with plenty of safety features to help boost your confidence on the road. In addition to standard equipment like a rearview camera and dynamic stability and traction control, the Mazda3 can be outfitted with i-ACTIVESENSE® driver-assistance technologies. These systems include blind spot monitoring, lane departure warning, high beam control, dynamic cruise control and forward collision warning with automatic braking. 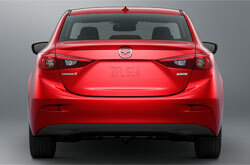 Is the Mazda Mazda3 Right for You? If you live in the Houston area and have been considering a new car like the 2017 Honda Civic, Hyundai Elantra, VW Jetta and the Chevy Cruze, we propose you take a prolonged look at the 2017 Mazda Mazda3. You could find that with its plenitude of great features and driver-focused persona, it accommodates your unique needs. Utilize the tools in our review to find out if the 2017 Mazda Mazda3 is right for you, then browse current finance and lease offers! Find offers on the extolled Mazda Mazda3 at Joe Myers Mazda, a local dealership with a standout selection of Mazda models. We've provided this 2017 Mazda Mazda3 review because it's paramount to make an authoritative decision when you're picking out a car. 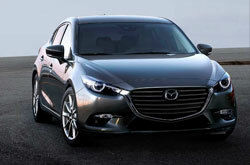 Our dealership offers a large reservoir of stately Mazda Mazda3 models in Houston, TX. Visit us to take one for a spin. If you're interested to see it preceding your visit, view its cabin and see how it's outfitted in the included video.